For decades, scientists have been trying to make a true molecular chain: a repeated set of tiny rings interlocked together. 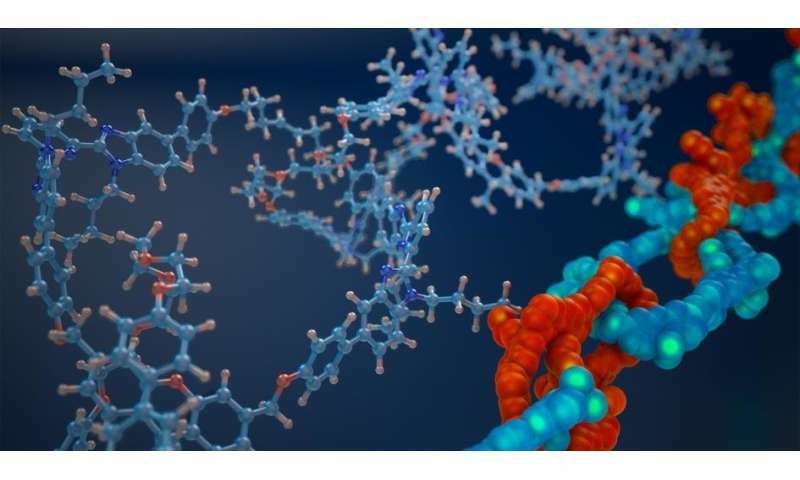 In a study in Science published online Nov. 30, University of Chicago researchers announced the first confirmed method to craft such a molecular chain. Many molecules described as "linked" are joined with fixed covalent bonds—not two freely moving interlocked rings. The distinction makes a big difference when it comes to how the chain moves. "Think about dangling a silver chain onto your palm: It collapses easily into a flat pool and can flow off your hand, much different from a string of fixed beads," said Stuart Rowan, a professor at UChicago's Institute for Molecular Engineering and Department of Chemistry and lead author on the paper. The longer interlocked chains could make materials or machines with intriguing properties, researchers said. Polymers—materials made of repeated units joined together—are extremely useful in everyday life, making up everything from plastics to proteins; and this new way to combine the repeat units could open new avenues in engineering. "A metal rod is rigid, but a metal chain made of the same material is very flexible," said UChicago postdoctoral researcher Qiong Wu, the first author on the paper. "By keeping the same chemical composition but changing the architecture, you can dramatically change the material's behavior." Previous techniques—including one that earned its inventor a share in the 2016 Nobel Prize in Chemistry—had only been able to link at most seven rings together. Instead of trying to combine sets of two or three loops into a larger chain, the new method combines a number of closed rings and open loops. They added a metal ion that held the loops and rings together, performed a reaction to close the open loops and then removed the metal to reveal a set of interlocked loops all at once, two dozen or more loops long. Because they are so vanishingly small—each loop is about a nanometer in diameter, less than a hundred atoms across—the team spent a lot of time proving the chain really had freely rotating loops. But a combination of experimental and computational techniques convinced the researchers they were real. It's been theorized that such chains should absorb energy well—a useful property for dampening sound or absorbing vibrations. It should use less energy to collapse into smaller configurations, since it takes less energy to move a ring than to manipulate covalent bonds. It's even possible the chains could be built to expand and contract like an accordion based on a stimulus; all interesting abilities for tiny machines. "This is really a new polymer architecture, which could offer you all the benefits of polymers—such as powerful functionality and tunability—plus the ability to coordinate and engineer their motion at the very small scale," said graduate student Phil Rauscher, also a coauthor. "We're very excited to explore their properties now that we know how to make them," Rowan said.